نوشیدن آب آلوده به نیترات در درازمدت تهدید جدی برای سلامتی انسان محسوب می‌شود. در این مطالعه افزایش توانایی گرافن اکساید توسط فعال‌سازی با اسید کلریدریک به‌منظور حذف نیترات از محیط‌های آبی مورد بررسی قرار گرفت. آزمایش‌ها به‌صورت ناپیوسته و با تغییر فاکتورهای مؤثر در واکنش مانند pH، زمان ماند، غلظت نیترات، غلظت گرافن اکساید و گرافن اکساید فعال شده، صورت گرفت و کارایی حذف با استفاده از آزمون آماری ONE WAY ANOVA و نرم‌افزار SPSS-16 مورد بررسی قرار گرفت. مشخصات ساختاری گرافن اکساید فعال شده با استفاده از روش FE-SEM مجهز به طیف سنجی پراش انرژی و سطح ویژه آن نیز با استفاده از روش BET و BJH تعیین شد. نتایج نشان می‌دهد که 52 درصد ساختار گرافن اکساید فعال شده از کربن تشکیل شده و متوسط قطر منافذآن26/896 نانومتر می‌باشد. 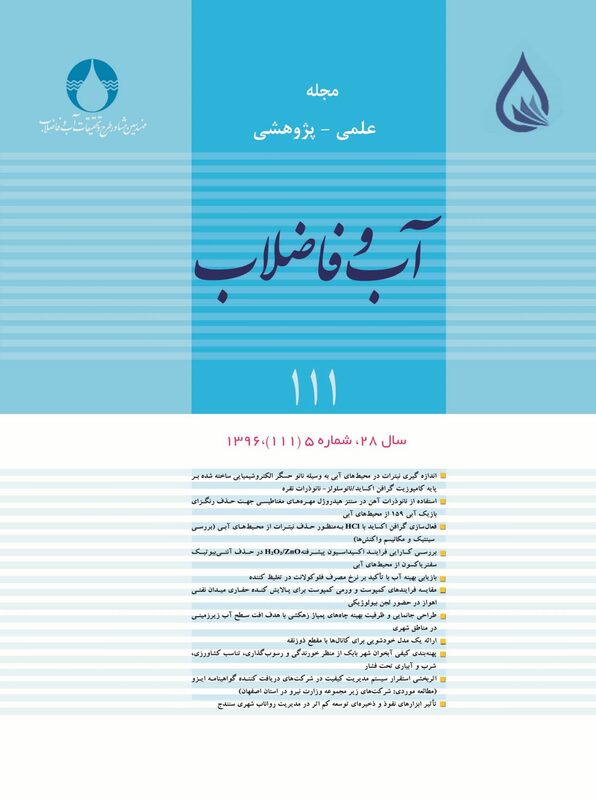 در این مطالعه حداکثر میزان جذب تعادلی برآورد شده توسط گرافن اکساید فعال شده در حدود 33/3333 میلی‌گرم بر گرم برای نیترات به‌دست آمد که این مقدار از مقادیر گزارش شده توسط سایر جاذب‌های مطالعه شده تاکنون بسیار بالاتر است. با توجه به نتایج حاصله می‌توان از گرافن اکساید فعال‌سازی شده به‌عنوان یک روش جدید برای حذف نیترات از محیط های آبی بهره برداری نمود. Long-term drinking of nitrate-contaminated water poses a serious risk to human health. The present study explores the possibility of enhancing the adsorption capacity of graphene oxide via activation with hydrochloric acid for nitrate removal from aqueous solutions. Experiments were performed in a batch reactor in which such major factors as pH, reaction time, and concentrations of both graphene oxide (GO) and activated graphene oxide (AGO) were used as variables. Nitrate removal efficiency was investigated using the One-Way ANOVA statistical test and SPSS-16 software. The chemical composition and solid structure of the synthesized AGO were analyzed using FE-SEM coupled with energy dispersive spectrometry (EDS). The micropore volumes of the samples were determined using the BET and BJH. The predominant composition (52%) of the synthesized AGO was C and its mean pore diameter was 26.896 nm. The maximum adsorption capacity of AGO was estimated at 3333.33 mg/g. Based on the results, the AGO nano-structure may be recomended as a new means for nitrate removal from aqueous solutions. Afkhami, A., Madrakian, T. & Karimi, Z., 2007, "The effect of acid treatment of carbon cloth on the adsorption of nitrite and nitrate ions", Journal of Hazardous Materials, 144, 427-431. Ahn, S.C., Oh, S-Y. & Cha, D.K., 2008, "Enhanced reduction of nitrate by zero-valent iron at elevated temperatures", Journal of Hazardous Materials, 156(1-3), 17-22. APHA, WPCF., 2005, Standard method for the examination of water and wastewater, 21th Ed., Washingon D.C.
Eroglu, E., Zang, W., Eggers, P.K., Chen, X., Boulos R.A., Wahid, M.H., et al., 2013, "Nitrate uptake by p-phosphonic acid calixarene stabilized graphene", Chemical Communications, 49(74), 8172-8174. Forman, D., Al-Dabbagh, S. & Doll, R., 1985, "Nitrates, nitrites and gastric cancer in Great Britain", Nature, 313(6004), 620-625. Gao, Y., Li, Y., Zhang, L., Huang, H., Hua, J., Shah, S.M., et al., 2012, "Adsorption and removal of tetracycline antibiotics from aqueous solution by graphene oxide", Journal of Colloid and Interface Science, 368, 540-546. Geim, A.K., 2009, "Graphene", Status and Prospects Science, 324, 1530-1534. Gupta, S.S., Sreeprasad, T.S, Maliyekkal, S.M., Das, S.K. & Pradeep, T., 2012, "Graphene from sugar and its application in water purification", ACS Applied Materials & Interfaces, 4, 4156-4163. Hu, X-j., Liu, Y-G., Wang, H., Chen, A-W., Zeng, G-M., Liu S-M, et al., 2013, "Removal of Cu(II) ions from aqueous solution using sulfonated magnetic graphene oxide composite", Separation and Purification Technology, 108,189-195. Huang, Z., Zhang, X., Lv, W., Wang, M., Yang, Q-H. & Kang, F., 2011, "Adsorption of lead(Ii) ions from aqueous solution on low_temperature exfoliated grapheme nanosheets", Langmuir, 27, 7558-7562. Jinamoni, S. & Goswami Archana, S., 2011, "Study of the removal of toxic anions from contaminanted water utilizing natural kaolinite clay of Assam", International Journal of Research in Chemistry and Environment, 2(1), 92-96. Kandaha, M.I. & Meunier, J-L., 2007, "Removal of nickel ions from water by multi-walled carbon nanotubes", Journal of Hazardous Materials, 12 (1-2), 283-288. Karim, A.H., Jalil, A., Triwahyono, S., Sidik, S.M., Kamarudin, N.H.N., Jusoh R., et al., 2012, "Amino modified mesostructured silica nanoparticles for efficient adsorption of methylene blue", Journal of Colloid and Interface Science, 386(1), 307-314. Khani, A. & Mirzaei, M., 2008, "Comparative study of nitrate removal from aqueous solution using powder activated carbon and carbon nanotubes", 2nd International IUPAC Conference on Green Chemistry, Russia, PP. 14-19. Kumar, S.K, Kakan, S.S. & Rajesh N., 2013, "A novel amine impregnated graphene oxide adsorbent for the removal of hexavalent chromium", Chemical Engineering Journal, 230, 328-337. Li, Z., Chen, F., Yuan, L., Liu, Y., Zhao, Y., Chai, Z., et al., 2012, "Uranium(VI) adsorption on graphene oxide nanosheets from aqueous solutions", Chemical Engineering Journal, 210, 539-546. Lin, S.H. & Wu, C.L., 1996, "Removal of nitrogenous compounds from aqueous solution by ozonation and ion exchange", Water Research, 30,1851-1857. Liu, W., 2005, "Catalyst technology development from macro-micro-down to nano-scale", China Particuology, 3(6), 383-394. Mahamudur, I., 2008, "Development of adsorption media for removal of lead and nitrate from water", Thesis to PhD degree of philosophy in chemistry", Department of Chemistry, National Institute of Technology Rourkela, India. Motamedi, E., Atouei, M.T. & Kassaee, M.Z., 2014, "Comparison of nitrate removal from water via graphene oxide coated Fe, Ni and Co nanoparticles", Materials Research Bulletin, 54, 34-40. Naddafi, K., Nabizadeh Nodehi, R. & Jahangiri Rad, M., 2011, "Removal of reactive blue 29 dye from water by single-wall carbon nanotubes", Iranian Journal Health & Environment, 3(4), 359-368. Ohe, K., Nagae, Y., Nakamura, S. & Baba, Y., 2003, "Removal of nitrate anion by carbonaceous materials prepared from bamboo and coconut shell", Journal of Chemical Engineering of Japan, 36, 511-515. Polshettiwar, V. & Varma R.S., 2010, "Green chemistry by nano-catalysis", Green Chem, 12, 743-754. Rao, C.N., Sood, R., Subrahmanyam, A.K. & Govindaraj, A., 2009, "Graphene: The new two-dimensional nanomaterial", Angewandte Chemie, International Edition, 48, 7752-7777. Reynolds, D.T. & Richards, A. P., 1995, Unit operation and processes in environmental engineering, Sharif University, Tehran. Romanchuk, A.Y., Slesarev, A.S., Kalmykov, S.N., Kosynkin, D.V. & Tour, J.M., 2013, "Graphene oxide for effective radionuclide removal", Physical Chemistry Chemical Physics, 15(7), 2321-2327. Shrimali, M. & Singh, K.P., 2001, "New methods of nitrate removal from water", Environmental Pollution, 112(3), 351-359. Stafiej, A. & Pyrzynska, K., 2007, "Adsorption of heavy metal ions with carbon nanotubes", Separation and Purification Technology, 58, 49-52. Stafiej, A. & Pyrzynska, K., 2008, "Extraction of metal ions using carbon nanotubes", Microchemical Journal, 89, 29-33. Sun, L., Yu, H. & Fugetsu, B., 2012, "Graphene oxide adsorption enhanced by in situ reduction with sodium hydrosulfite to remove acridine orange from aqueous solution", Journal of Hazardous Materials, 203-204, 101-110.
WHO, 2008, Guideline for drinking water quality background document for development of WHO, 3rd World Health Organization, USA. Yang S-T., Chen, S., Chang, Y., Cao, A., Liu, Y. & Wanga, H., 2011, "Removal of methylene blue from aqueous solution by graphene oxide", Journal of Colloid and Interface Science, 359, 24-29. Yu, B., Xu, J., Liu, J-H., Yang, S-T., Luo, J., Zhou, Q., et al., 2013, "Adsorption behavior of copper ions on graphene oxide–chitosan aerogel", Journal of Environmental Chemical Engineering, 1(4), 1044-1050. Zhang, K., Dwivedi, V., Chi, C. & Wu, J., 2010, "Graphene oxide/ferric hydroxide composites for efficient arsenate removal from drinking water", Journal of Hazardous Materials, 182, 162-168.